Sindh (Sindhi: ???? ; Urdu: ? ; Latin: ; Ancient Greek: Sanskrit: ????? ) is one of the five provinces of Pakistan and historically home to the Sindhi people. It is also locally known as the Mehran. The name "Sindh" is derived from the Sanskrit Sindhu, a reference to the Indus River that passes almost through the middle of the entire province. This river was known to the ancient Iranians in Avestan as Hindu, in Sanskrit as Sindhu, to Assyrians (as early as the seventh century BC) as Sinda, to the Persians as Ab-e-sind, to the Greeks as Indos, to the Romans as Indus, to the Pashtuns as Abasind, to the Arabs as Al-Sind, to the Chinese as Sintow, and to the Javanese as Santri. Sindh is bounded to the west by Balochistan, to the north by Punjab, to the east by the Indian states of Gujarat and Rajasthan and to the south by the Arabian Sea. The capital and largest city of the province is Karachi, which is also Pakistans largest city and the countrys only financial hub. Most of the population in the province is Muslim, with sizable Hindu, Ahmadiyya, Christian, Parsi and Sikh minorities. Sindhs first known village settlements date as far back as 7000 BCE. Permanent settlements at Mehrgarh, currently in Balochistan, to the west expanded into Sindh. This culture blossomed over several millennia and gave rise to the Indus Valley Civilization around 3000 BCE. The Indus Valley Civilization rivaled the contemporary civilizations of Ancient Egypt and Mesopotamia in size and scope, numbering nearly half a million inhabitants at its height with well-planned grid cities and sewer systems. The Indus Valley Civilization is the farthest known outpost of archaeology in prehistoric times. Evidence of a new element of pre-Harappan culture has been traced here. When the primitive village communities in Balochistan were still struggling against a difficult highland environment, a highly cultured people were trying to assert themselves at Kot Diji. This was one of the most developed urban civilizations of the ancient world. It flourished between the 25th century BC and 1500 BC in the Indus valley sites of Mohenjo-daro and Harappa. The people had a high standard of art and craftsmanship and a well-developed system of quasi-pictographic writing which remains un-deciphered despite ceaseless efforts. The remarkable ruins of the beautifully planned towns, the brick buildings of the common people, roads, public baths and the covered drainage system suggest a highly organized community. According to some accounts, there is no evidence of large palaces or burial grounds for the elite. The grand and presumably holy site might have been the great bath, which is built upon an artificially created elevation. This indigenous civilization collapsed around 1700 BC. The cause is hotly debated, and may have been a massive earthquake, which dried up the Ghaggar River. Skeletons discovered in the ruins of Mohen Jo Daro ("mount of dead") indicate that the city was suddenly attacked and the population was wiped out. Sindh finds mention in the Hindu epic Mahabharata as being part of Bharatvarsha. Sindh was conquered by the Persian Achaemenid Empire in the sixth century BC. In the late 300s BC, Sindh was conquered by a mixed army led by Macedonian Greeks under Alexander the Great. The region remained under control of Greek satraps for only a few decades. After Alexanders death, there was a brief period of Seleucid rule, before Sindh was traded to the Mauryan Empire led by Chandragupta in 305 BC. During the rule of the Mauryan Emperor Ashoka, the Buddhist religion spread to Sindh. Mauryan rule ended in 185 BC with the overthrow of the last king by the Sunga Dynasty. In the disorder that followed, Greek rule returned when Demetrius I of Bactria led a Greco-Bactrian invasion of India and annexed most of northwestern lands, including Sindh. Demetrius was later defeated and killed by a usurper, but his descendants continued to rule Sindh and other lands as the Indo-Greek Kingdom. Under the reign of Menander I many Indo-Greeks followed his example and converted to Buddhism. In the late 100s BC, Scythian tribes shattered the Greco-Bactrian empire and invaded the Indo-Greek lands. Unable to take the Punjab region, they invaded South Asia through Sindh, where they became known as Indo-Scythians (later Western Satraps). 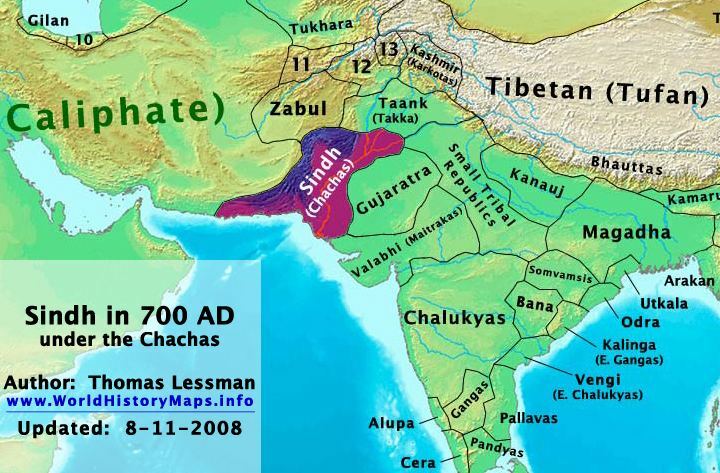 By the first century AD, the Tocharian Kushan Empire annexed Sindh. Though the Kushans were Zoroastrian and Shamanists, they were tolerant of the local Buddhist tradition and sponsored many building projects for local beliefs. Ahirs were also found in large numbers in Sindh. Abiria country of Abhira tribe was located in southern Sindh. The Kushan Empire was defeated in the mid 200s AD by the Sassanid Empire of Persia, who installed vassals known as the Kushanshahs in these far eastern territories. These rulers were defeated by the Kidarites in the late 300s. It then came under the Gupta Empire after dealing with the Kidarites. By the late 400s, attacks by Hephthalite tribes known as the Indo-Hephthalites or Hunas (Huns) broke through the Gupta Empires northwestern borders and overran much of northwestern India. Sindh came under the rule of Emperor Harshavardhan, then the Rai Dynasty around 478 AD. The Rais were overthrown by Chachar of Alor around 632. The Brahman dynasty ruled a vast territory that stretched from Multan in the north to the Rann of Kutch, Alor was their capital. Sindh is located on the western corner of South Asia, bordering the Iranian plateau in the west. Geographically it is the third largest province of Pakistan, stretching about 579 kilometres (360 mi) from north to south and 442 kilometres (275 mi) (extreme) or 281 kilometres (175 mi) (average) from east to west, with an area of 140,915 square kilometres (54,408 sq mi) of Pakistani territory. Sindh is bounded by the Thar Desert to the east, the Kirthar Mountains to the west, and the Arabian Sea in the south. In the centre is a fertile plain around the Indus River. Sindh lies in a tropical to subtropical region; it is hot in the summer and mild to warm in winter. Temperatures frequently rise above 46 °C (115 °F) between May and August, and the minimum average temperature of 2 °C (36 °F) occurs during December and January in the northern and higher elevated regions. The annual rainfall averages about seven inches, falling mainly during July and August. The southwest monsoon wind begins to blow in mid-February and continues until the end of September, whereas the cool northerly wind blows during the winter months from October to January. Sindh lies between the two monsoons—the southwest monsoon from the Indian Ocean and the northeast or retreating monsoon, deflected towards it by the Himalayan mountains—and escapes the influence of both. The regions scarcity of rainfall is compensated by the inundation of the Indus twice a year, caused by the spring and summer melting of Himalayan snow and by rainfall in the monsoon season. Sindh is divided into three climatic regions: Siro (the upper region, centred on Jacobabad), Wicholo (the middle region, centred on Hyderabad), and Lar (the lower region, centred on Karachi). 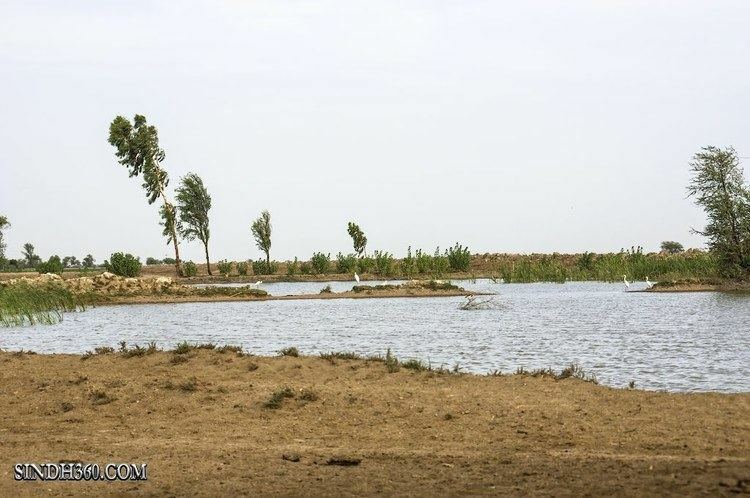 The thermal equator passes through upper Sindh, where the air is generally very dry. Central Sindhs temperatures are generally lower than those of upper Sindh but higher than those of lower Sindh. Dry hot days and cool nights are typical during the summer. Central Sindhs maximum temperature typically reaches 43–44 °C (109–111 °F). 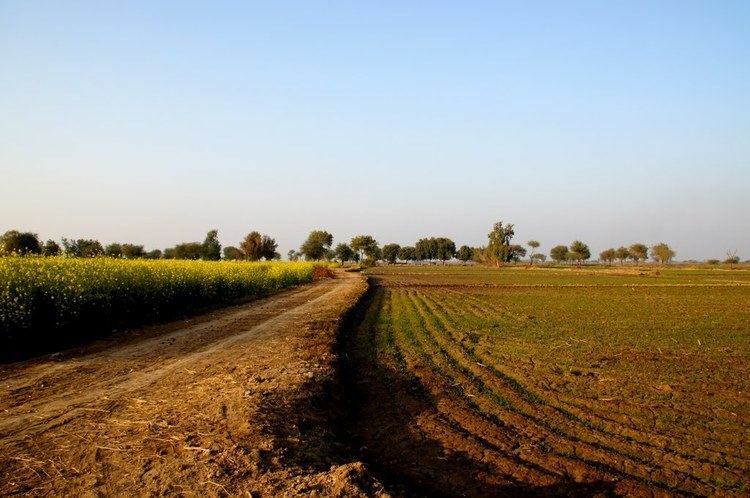 Lower Sindh has a damper and humid maritime climate affected by the southwestern winds in summer and northeastern winds in winter, with lower rainfall than Central Sindh. Lower Sindhs maximum temperature reaches about 35–38 °C (95–100 °F). In the Kirthar range at 1,800 m (5,900 ft) and higher at Gorakh Hill and other peaks in Dadu District, temperatures near freezing have been recorded and brief snowfall is received in the winters. Sindh has the second largest economy in Pakistan. Its GDP per capita was $1,400 in 2010 which is 50 per cent more than the rest of the nation or 35 per cent more than the national average. Historically, Sindhs contribution to Pakistans GDP has been between 30% to 32.7%. Its share in the service sector has ranged from 21% to 27.8% and in the agriculture sector from 21.4% to 27.7%. Performance wise, its best sector is the manufacturing sector, where its share has ranged from 36.7% to 46.5%. Since 1972, Sindhs GDP has expanded by 3.6 times. 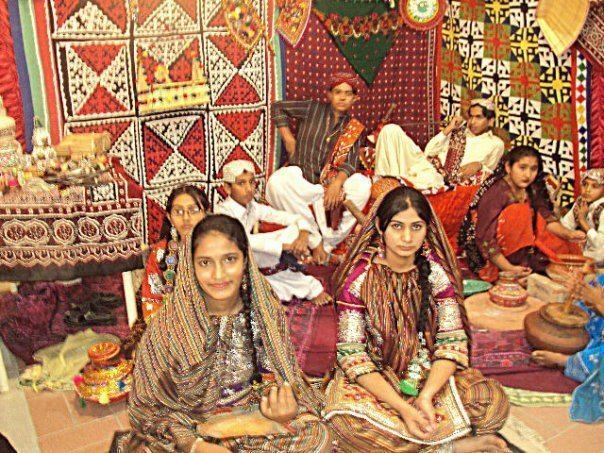 Sindhi culture is known all over the world for its arts, crafts and heritage. Sindhi cuisine (Sindhi: ???? ????) refers to the native cuisine of the Sindhi people from Sindh, Pakistan. The daily food in most Sindhi households consists of wheat-based flat-bread (phulka) and rice accompanied by two dishes, one gravy and one dry. Today, Sindhi food is eaten in many countries including India, where a sizeable number of Hindu Sindhis migrated following the independence in 1947. The arrival of Islam within South Asia influenced the local cuisine to a great degree. Since Muslims are forbidden to eat pork or consume alcohol and the Halal dietary guidelines are strictly observed, Muslim Sindhis focus on ingredients such as beef, lamb, chicken, fish, vegetables and traditional fruit and dairy. Hindu Sindhi cuisine is almost identical with the difference that beef is omitted. The influence of Central Asian, South Asian and Middle Eastern cuisine in Sindhi food is ubiquitous. Sai bhaji chawal, a popular dish from Sindh consists of white steamed rice served with spinach curry which is given a tarka with tomatoes,onions and garlics. Koki is another popular Sindhi flat-bread that is prepared with wheat flour and goes well with any dal, sabzi or even curd or chai. Vermicelli, typically served as a sweetened (sometimes milk-based) dessert, is popular: Muslim Sindhis serve it on Bakri-Id and Eid ul-Fitr. On special religious occasions, mitho lolo, accompanied with milk, is given to the poor. Mitho lolo is also served with chilled buttermilk called Matho on various occasions. A special sweet dish called Kheer Kharkun are prepared and served on Eid ul-Fitr, it is prepared by mixing dates and milk, and slowly simmering the mixture for few hours. The dish is eaten hot in winters and cold in summers. Pallo Machi, a popular Sindhi delicacy, is Hilsha fish prepared with numerous cooking methods. It can be deep fried and garnished with local spices, can be cooked with onions and potatoes into a traditional fish meal or barbequed. The fish often has roe, which is called "aani" in Sindhi and is enjoyed as a delicacy. Often fried alongside the palla and served with the fish fillets.